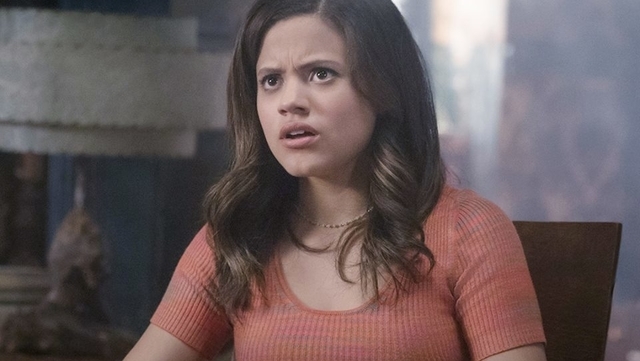 In the previous episode of The CW’s Charmed, the Vera sisters captured the Harbinger, and Harry charged them with watching it until the Elders arrived. In Charmed season 1 episode 4, the Elder, Charity Callahan, finally got there. And she had a plan. Niko and Trip came to the sisters’ house to inquire about Angela, since their party was the last place she was seen. Thankfully, Charity, who knew Marisol, pretended to be an interior decorator to cover up the loud noises the Harbinger was making. However, she told them they couldn’t save Angela. They would be killing her that night in a ritual. Until then, she wanted Mel to watch out for Niko and Trip since they were still suspicious. Mel was focused on saving Angela, since she believed her soul was still alive. She wanted to perform an exorcism, but Charity had insisted her soul was no longer there. She asked the Book of Shadows for help. It turned to a spell that proved to her that Angela’s soul was still in her body. Macy felt the logical action was to do the ritual as Charity wanted. She examined a rat that the Harbinger had killed with a single touch. It had died from an illness similar to smallpox. She posed a hypothetical question to Galvin about utilitarianism, and he rejected her stance, claiming that emotions weren’t bad. He invited her out that night, but she declined because of the ritual. Maggie just wanted to pass her World Literature midterm. She hadn’t finished reading The Divine Comedy, she was on academic probation, and the midterm was 50% of her grade. Lucy and Parker were in the class too, and Lucy insisted that Parker help Maggie study, but she ultimately asked for an extension and declined his help. Despite Mel’s discovery, Charity stood firm since there wasn’t an exorcism spell strong enough. She took the Harbinger with her and picked up Maggie. They went to where the Kappa homecoming float was stored. They were going to try to exorcise Angela, but the Book of Shadows flipped to blank pages. Meanwhile, Harry left to find Mel, Maggie, and the Harbinger, while Charity and Macy prepared for the ritual. Charity told Macy about an anguish spell that Marisol had asked her to perform. Though she didn’t know why at the time, it made sense now that she knew of Macy’s existence. Macy was so moved by the story that she went to Mel and Maggie, and the pages in the Book revealed themselves. It was a Santeria-based spell that Marisol, who had prophetic powers, wrote for them. They successfully exorcised the Harbinger out of Angela. She was okay, with no memory of waking from the coma. But since Trip was still suspicious, he was at the warehouse during the exorcism and died. Charity took care of the body, making it look like he killed himself. She also planted evidence linking him to the deaths during Halloween. She had taken the vessel, a paint can, that contained the Harbinger. At her office, a demon compelled Charity to trade paint cans with him, and she did. 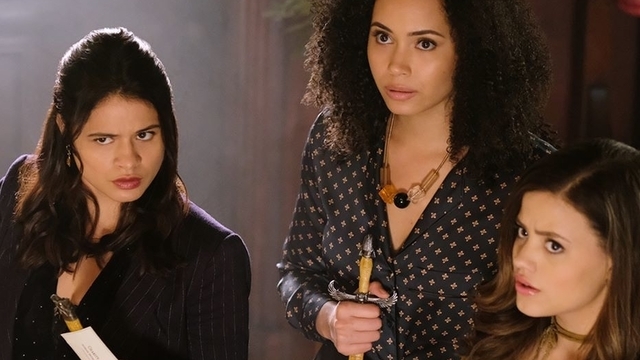 What did you think about Charmed season 1 episode 4? Let us know in the comment section below!